I do remember hearing the original story on MTV News back in 1992. As a coming of age teenager, I found it an intriguing one. And then I put it out of my mind until this movie came about. It looked like a good movie, and of course I wanted to check out something for which Eddie Vedder had done the entire soundtrack. I was immediately sucked into the story and have revisited it numerous times since the movie came out in 2007, especially during times of deep reflection. What better time than New Year’s Eve? I was also thinking about this story because I came across a free library of books to share and a copy of the paperback with the original cover was one of the available books. (I do still have the paperback I bought back in 2007, but that has the movie cover on it.) I have been aching to reread it, as well as use some of my holiday gift cards to get the follow-up story, The Wild Truth, written by his sister Carine. And I do still listen to the Into the Wild soundtrack by Eddie Vedder. I have other stories about that to share at another time. So, I have dug back into my archives and pulled out an article I wrote back in 2007 for the now defunct Associated Content (later dubbed Yahoo Contributor Network) that discusses why this trifecta of story, song, and picture grabbed my attention all those years ago. Enjoy. My three-fold love affair with Jon Krakauer’s Into the Wild began with the release of the movie soundtrack, with songs written and performed by Eddie Vedder. I have been a fanatic of Pearl Jam since the early 1990s and Eddie Vedder is my saving grace in life. I was immediately drawn in by his melodic voice and rhythmic melodies. My curiosity about the book was piqued soon afterward as I saw it displayed at all of the local booksellers. I read a little bit about it and the forthcoming movie and decided to go against my usual rule and buy the book only if I enjoyed the movie. The movie, written and directed by Sean Penn, was released in limited theaters on September 21, 2007 and released widely on October 19th. I finally saw it at the local independent theater on November 12th. Immediately mesmerized by the poignant story, I immediately went out the next day, armed with a coupon for Borders, eagerly searching the novel that had inspired such a wonderful movie and such moving music. Finally on Friday night, I took the time to sit down, read the book, and digest its meaning. The book is so moving, especially after having seen the movie and repeated listening of the soundtrack, that I cried throughout most of it. Chris McCandless had just graduated from Emory University, with the potential of starting Harvard Law in the fall. Instead, he chose to give his entire savings to Oxfam, a charity benefiting the hungry, and took off for his final trek cross-country. He abandoned his car, burned his identification and money, and began a quest to find peace in the Alaskan Wilderness. Along the way, he touched many lives, before losing his own. Jon Krakauer was a writer who was assigned to research the wayward young man whose body had been discovered in August of 1992. He devoured the journals and letters left behind by the young man, and proceeded to follow his journey, eager to discover who Chris McCandless, a.k.a. “Alexander Supertramp” really was and determined to give him “new life”. The book is written in a style that is very reminiscent of Truman Capote’s In Cold Blood. It is very matter-of-fact, yet with enough heart to make you truly feel for the subject at hand. Krakauer takes care to be gentle with Chris’s survivors and their memories, while giving a pieced-together factual account of the young man’s story. He makes sure he presents arguments from people who think that Chris was a spoiled, ignorant brat who deserved his demise, while also giving reasons why Chris should be admired for what he did. 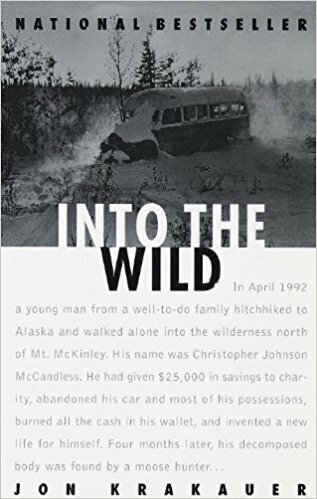 Krakauer is also quick to point out that McCandless was not the first young man to possess dreams of living out life in the Alaskan frontier. He tells the stories of other wayward explorers. He also shares his own similar experiences, which obviously had a more positive outcome. Some people have called Into the Wild the modern-day On the Road (by Jack Kerouac). While the most basic idea of a young man renouncing society and traveling cross-country exists in both stories, readers must be cautioned that Krakauer’s story is a nonfiction account and Kerouac’s is a more romanticized fictional story that is loosely based on real events. Both books can lead to introspection, but comparing the two is like comparing apples to oranges. They are both fruits that contribute to good health, but taste completely different and provide different nourishment. If anything, they can complement each other, and you are likely to prefer one over the other. For me, I prefer Into the Wild. Perhaps I can relate to it better, having grown up in the same generation as Krakauer and McCandless. Maybe it’s because the movie and the soundtrack speak to me just as loudly as the book. But whether you prefer apples or oranges, it’s worth tasting the fruit, just for a new and enlightening experience. Then try different varieties of your favorite fruit by checking out the soundtrack and movie. The trilogy will provide some nourishment that you may not have realized you craved.